While shopping for my daughter recently, I embarked on a mission for the perfect pair of shoes. Oh sure, pretty children’s shoes are everywhere and I won’t pretend I didn’t stock up on lots of gorgeous party shoes. No, my mission was to find a pair of basic yet stylish shoes for everyday use from child care to the park. I came home empty-handed. Of course now that I’ve spent all my money on party shoes, I’ve come across ChilliKids. 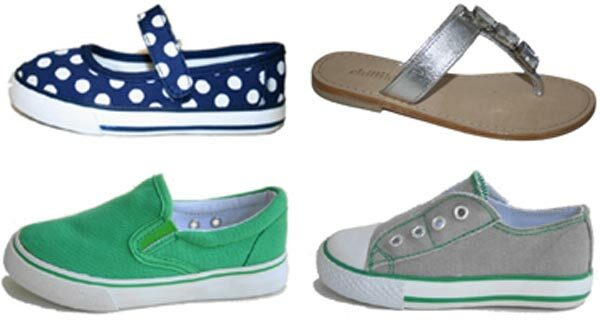 There’s still plenty of pretty shoes for girls and sweet shoes for boys (check out the gorgeous sandals, $59.95) but mostly ChilliKids has exactly the kind of shoe I’ve been looking for – canvas uppers with rubber soles ready for a bit of rough and tumble at $34.95. How gorgeous are the spotted Lilli and the grey-with-green-trim Kobe? I love the bold colours!